After successfully revamping its iconic 500 model, the Italian automobile manufacturer FIAT launched the 500X crossover. To compete in an ultra-competitive market, FIAT France partnered with YouTube to produce an ad and measured impact in terms of ad recall, brand awareness, and search volume. With 13 million views, the FIAT 500X YouTube ad remains one of the top three most-viewed videos during the 2015 Super Bowl, with an impressive completion rate of 84%. Overall, the ad was a smashing success, but did it reach the target audience? How did it reach it? What impact did it have on car sales? Because each model in the 500 family has its own target audience, FIAT France created its version of a media laboratory to better understand and identify the users who watched its YouTube ad. A few days before launching communication on all other media, the car maker analyzed reaction to the YouTube ad. The video was 1 minute and 20 seconds, so a key comparison was established between those who watched more than 30 seconds or less than 30 seconds. To top it off, the company also tracked how different age groups responded to the ad. Of those exposed to the YouTube ad, FIAT France recorded a lift in ad recall of 123% among target buyers (between 45 and 54 years old) and a 82% lift among its "market entry" target audience (over 35 year-olds). For those in the "market entry" target audience who watched more than 30 seconds of the ad, the lift increased to a 175% ad recall rate. 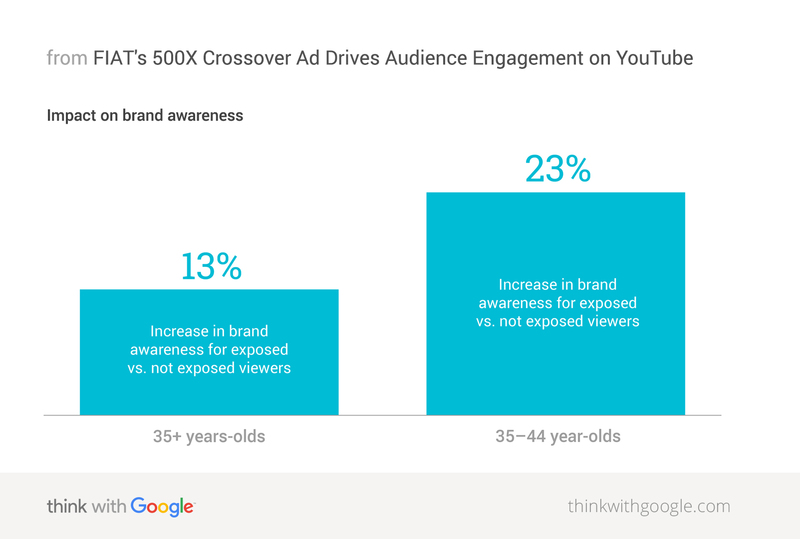 Of those who were exposed to the YouTube ad, FIAT France observed a 23% increase in brand awareness among its "market entry" target group (35—44 years old). 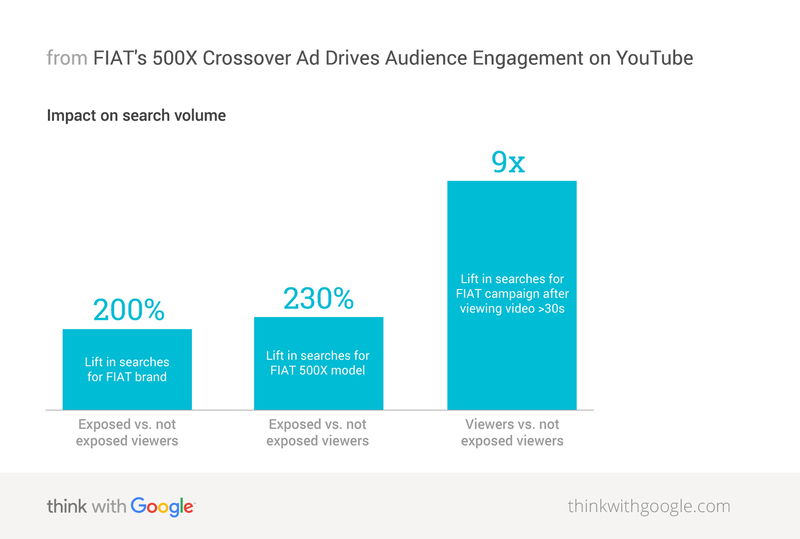 In comparing those who were exposed with those who were not exposed to the YouTube ad, FIAT France observed a 230% increase in search volume for the FIAT 500X model and a 200% increase for the FIAT brand. Similarly, search interest for all campaign keywords increased 9X. 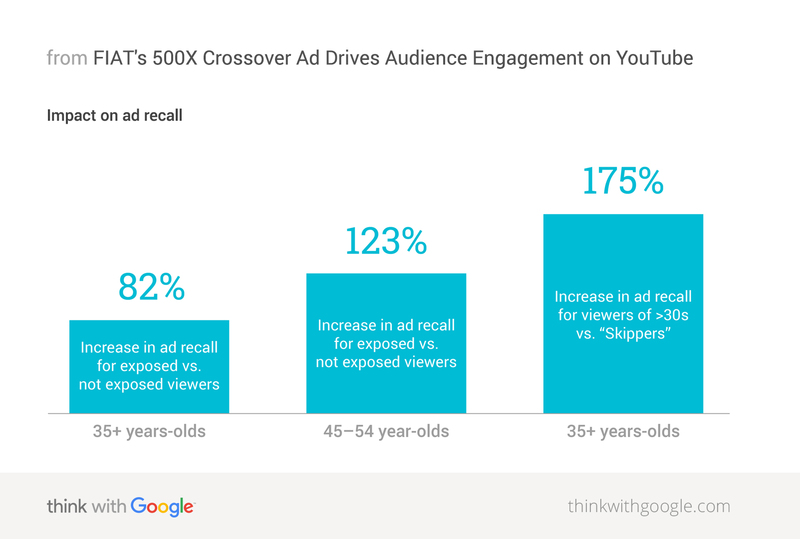 Analyzing across a variety of metrics helped the brand understand the impact of the YouTube ad and how internet users were feeling about and engaging with the advertising for the new 500X model. Armed with this knowledge, FIAT France could launch its full media campaign with confidence. "We were working in an ultra-competitive segment. The YouTube campaign was launched before any other media, so we could attribute 100% of the results to YouTube. We realized that by studying the audience, we managed to better understand and address it. I got the feeling that we were no longer driving by intuition, but rather based on observed facts." —Jérémie Ballouard, Digital Marketing Manager at FIAT France Group.